Instant Replay Review confirmed 2B Umpire Seth Buckminster's safe call in the top of the 9th inning of the Angels-Mariners game. 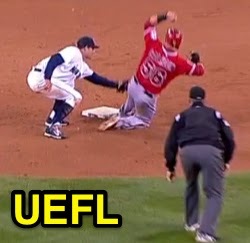 With one out and one on, Angels baserunner R1 Kole Calhoun attempted to steal second base off a pickoff throw by Marlins pitcher Charlie Furbush to first baseman Justin Smoak to shortstop Brad Miller as Calhoun arrived at second. Upon Instant Replay Review as the result of a challenge by Mariners Manager Lloyd McClendon, Buckminster's ruling that Miller did not tag Calhoun while he was off his base was affirmed, the call was correct. At the time of the review, the Angels were leading, 2-0. The Angels ultimately won the contest, 2-0. This is Seth Buckminster (67)'s second Instant Replay Review of 2014. Seth Buckminster is now 1/2 (.500 Affirmation Rate) in Replay Reviews in 2014. Crew Chief Mike Winters' crew is now 3/6 (.500 Affirmation Rate) in Replay Reviews in 2014. This is the 64th Instant Replay Review of the 2014 MLB Regular Season. Mariners Manager Lloyd McClendon is now 1/3 (.333 Success) in Instant Replay Reviews during 2014. Umpires are now 43/64 (.672 Affirmation Rate) in Instant Replay Reviews during the 2014 MLB season. I hope the replay guys says things on those headsets like "That's a great effing call, Seth!" That was really a great call. Seth must have some kind of super human vision to see this.... Or just got lucky.. wow. Really ballzy call. Great call! How many ejections do you think this would have ended up with if there wasn't replay?